It's probably not fair to compare this movie to THE FAULT IN OUR STARS, but the reality is that it is really hard not to do it since they are both based on John Green novels. That said, PAPER TOWNS is not nearly as good as TFIOS. It's not a bad movie at all, it just doesn't have that magic that we all experienced with TFIOS. Cara and Nat do a decent job, but they aren't quite accomplished enough yet to carry a film like this. I feel it might have been a much better movie with the likes of Ansel Elgort and Shailene Woodley as the leads. While I do recommend seeing it at some point, it's not a film you need to see in theaters. It is worth the time to check it out when it comes out on DVD, because there are several good moments throughout. If you go into it thinking TIFIOS you will be disappointed. But if you go in thinking that it's a coming-of-age story you'll leave mostly satisfied. Thank goodness for Josh Gad. He should be required casting for all comedies from now on. Without him, this movie would have been barely tolerable. The best way I can describe PIXELS is by saying it's kind of like eating candy. It looks good, it tastes good, but then you realize that what you've just ingested has zero nutritional value and is, in fact, slowly killing you. On a scale of Adam Sandler flicks this one ranks as above average, but it's only because the effects are fun and Josh Gad is hysterical. The rest of the film is full of bad dialogue and mediocre jokes. 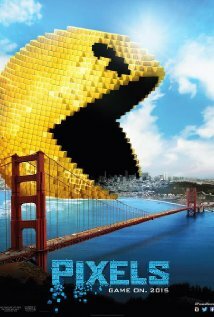 If you like Sandler movies, then you will enjoy PIXELS a lot, but if you find his style to be tired, then you will walk out of this movie feeling slightly amused at best. Plot: A champion boxer loses everything and must work hard to get his daughter and life back. I wish I could say that this movie was better than it was. It had a lot of potential to be great, unfortunately, Director Antoine Fuqua let us all down. As a big boxing fan, I was excited to see a rough and gritty fight film. Instead, I saw a movie where the director didn't even bother to get the boxing right. The pacing was also problematic throughout the movie. In some places it drags on and gets to the point of almost being boring, then it speeds through other parts so fast the audience misses key elements to the story. Jake Gyllenhaal gives another incredible performance. While not Oscar-worthy like NIGHTCRAWLER was, he proves once again that he is one of the best actors in Hollywood. He's one of the few with the ability to disappear into a role. Rachel McAdams does fine as well, but Oona Laurence completely steals the show. She is the 10 year old daughter, Leila. This is a girl that has every opportunity to be a superstar in the next 10 - 15 years. She may have even taught Jake and Rachel a few things about acting. The story itself is interesting, compelling, heartbreaking and inspiring, unfortunately it just isn't told well enough to be something that you need to see. Really satisfied with the film adaptation of Paper Towns and it has me very excited about seeing the soon to be Looking for Alaska.